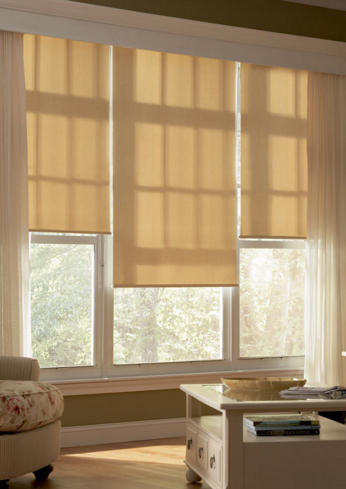 Roller shades are a simple, contemporary shade that is easy to use and is available in many fabrics. Several fabric colors and patterns available. From sheer to opaque; from floral to contemporary solids. Available in Blackout fabric for those rooms that you need to block out a lot of sun. Ex: bedrooms, home theaters, gaming rooms, etc. Solar fabrics available that block out UV light that can fade furniture and other home furnishings. Valances are not a standard item on roller shades. The roller that holds the fabric and the hardware are visible. So, to hide these, a valance that coordinates to your decor is normally desired. Cassette Headrail is one option. This rolled valance is simple and matches the shade fabric. Fascia Valance is another option. 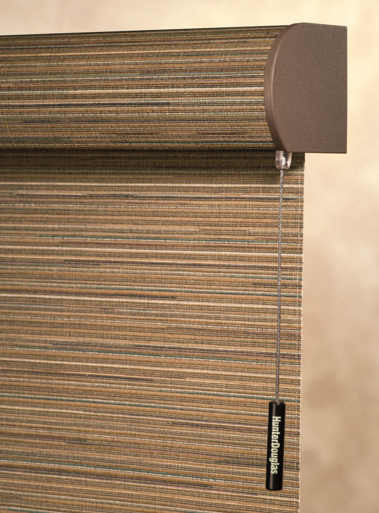 It is a simple metal valance that hides the top of the roller shade. 6″ Valances in the same fabric as the roller shade is available as well. These are more decorative and stylish than the first two valances listed. Since the roller shade normally has a sizeable gap on the sides due to the nature of this product, side channels are recommended to provide greater control on light allowance. Also, install an upgraded clutch to help in lifting and lowering heavy roller shades.